Perhaps you have seen the Mech Mod that adds a lot of different types of transport. Unfortunately, the one does not support the latest version of MCPE at the moment, but you can always download small modifications, for example, sports cars, tanks, motorcycles and the like. It is time for rotorcraft vehicles. 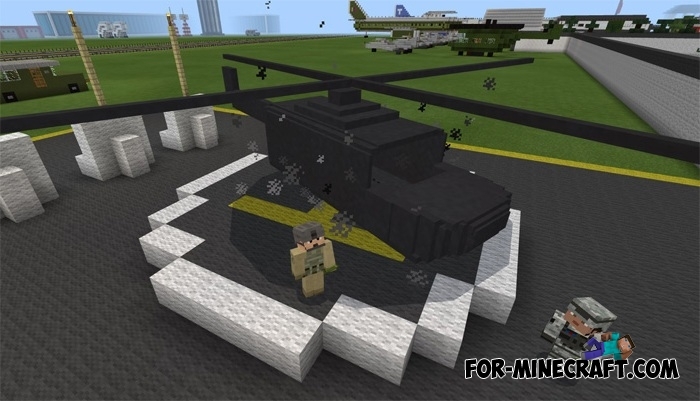 Helicopter mod replaces the blazes with transport helicopter which has a fuel tank and controls. So you can easily fly through the infinite world of Minecraft! You will be able to move from a winter biome to sand one for a few minutes. 1. The new look. 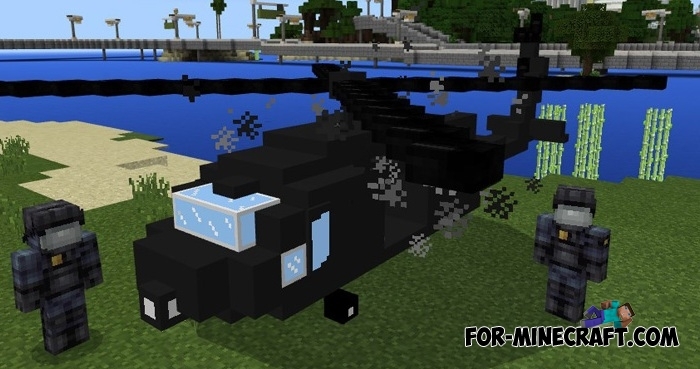 Now this is almost real Black Hawk has several differences from the previous version of the add-on. 2. 5 inventory slots to store all your things. You will often use this function when your inventory is full. 3. Helicopter gun that reacts only to aggressive creatures. The gun shoots infinite arrows and causes the same damage as a bow. This version allows you to control the helicopter only alone. You will not be able to fly with the other players. How to fill a helicopter and control it? Helicopter flies no more than 2 minutes after full fueling. To fill it you need to take the fuel can, and throw in your helicopter. The helicopter will gradually rise into the air to the maximum height. Select the diamond sword and look in the direction where you want to fly. The helicopter has 10,000 hearts, so it is very hard to kill in survival mode. How to install the Helicopter mod? Download the archive and unpack it. Activate these files in the game settings (behavior and resource-pack). Mech Mod v1.4.0 for Minecraft Pocket Edition 0.13/0.14/0.15/0.16.2 Mech modification adds 21 types of vehicles to the game that you can drive and fly. Cars and Drives Mod for Minecraft 1.7.10 / 1.7.2Cars and Drives Mod makes it possible to make real machine in minecraft. Most importantly, you can to drive a car! In a modification, six types of cars. The Infinite Adventure mod for Minecraft 1.7.10The mod adds a new structure in the minecraft, where you will meet new mobs, you will find a lot of values, and other useful things.